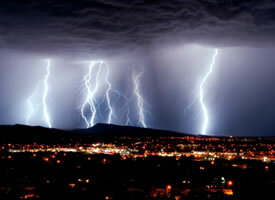 What is Lightning Protection, Maxwell Lightning Protection Co. Lightning is the visible discharge of static electricity within a cloud, between clouds, or between the earth and a cloud. Scientists still do not fully understand what causes lightning, but most experts believe that water droplets and ice crystals interact within the cloud. Updrafts in the cloud separate charges so that positive charges (ice crystals) end up at the top of the cloud while negative charges (water droplets) concentrate in the bottom. When the negative charge moves down, a "pilot leader" forms. This leader rushes toward the earth in discrete steps, approximately 150' in length, ionizing a path in the air. The final breakdown occurs when the path to earth, or an object on the earth is completed and the major part of the lightning discharge current is then carried upward in the return stroke following along the ionized path. The average flash of lightning carries an electrical charge of about 100 million volts. A lightning protection system provides a means by which this discharge may enter or leave the earth without passing through and damaging conducting parts of a structure, such as those made of wood, brick, tile or concrete. A lightning protection system does not prevent lightning from striking; it provides a means for controlling it and preventing damage by providing a low resistance path for the discharge of lightning energy. Don't be one of the many who have suffered a lightning disaster. Also known as lightning rods, must be installed on roof ridges, dormers, chimneys, ventilators, and other structures as required. Cables which interconnect the air terminals to grounds. These are typically copper or copper-clad rods driven into the earth a minimum of 10 feet in depth. These are made to equalize the potential between grounded metal objects. These protect wiring from lightning induced damage. These may be added to further protect valuable electronic equipment.